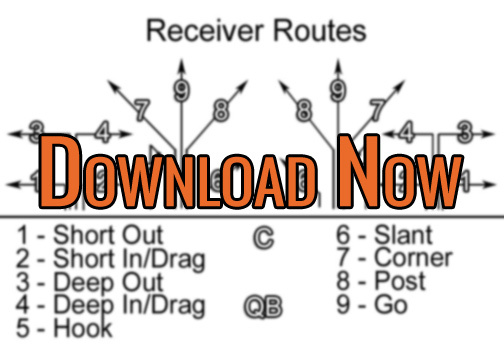 Flag football passing tree to start using with your team today. The tree is simple and you can download a copy to print fof your team. The video above shows the flag football passing tree that I use with my 9-11 year old team. This passing tree is a little different the conventional one you’ll generally find if you search on line. The reason that I decided to go with this one is that it contains the routes we most frequently run. The general set up of this passing tree is that odd numbered routes are run toward the sidelines. Even numbered routes are run toward the middle of the field. The exceptions to this rule are the 5 and 9 route which are just a hook (5) and a go route (9). If I want someone to run a combo route, I just combine two numbers. For example, a wheel route (which is an out and then a streak up the sideline) would be called a 19. A Post-Corner route is an 87. At the bottom of this post, there’s a download for a full page version of the passing tree I use. You can download and print for your whole team to use. Why Use a Passing Tree with Your Youth Flag Football Team? There are several reasons to use a passing tree with your team. The main one for me is ease of play calling. It’s just simpler to call Trips Left 841, instead of Trips Left, Post, Deep Drag, Short Out. Of course, the easiest method may be to add this play to your playbook with a simple number name of 14 for example. Then, calling this play would be just a matter of calling 14. However, having the passing tree in your arsenal call add greater flexible. A second reason is audibles. Now, at the 9 year old level, not too many quarterbacks are going to coming to the line of scrimmage, reading the defense, and making a switch to a play. But there are times when I call a play, see the defense line up in something different, and call switch a few routes after my team has lined up on the ball. The usual switch is calling someone off a deep route to a slant or hook when the defense lines up deeper expected. One option I have done is to call a play with route for everyone but one receiver. I tell the quarterback to call out a route for the one receiver after coming to the line scrimmage. I mainly do this to get my team thinking instead of just hearing a play and running it. I also do it because many kids want to be like Peyton Manning. This gives them a little taste. One final reason to use a passing tree is running a hurry up or no huddle offense. This goes hand in hand with the easier play calling reason from above. But having easier play calling means that your offense can just line up, you can call out some routes, and the play is moving. You can also have a no huddle offense with set plays, but your options could be limited. Personally, with my team, they all wanted to get wristbands. I put 8 of our plays in them and assigned them a numeric name. Each of the plays in the wristband has the routes diagrammed so the offense can visualize the play. If we’re going hurry up, I can call 42. Once the offense lines up, I can call “Hold!” which signals the quarterback to wait for my OK to snap the ball. I can survey the defense, call something out like X-6, Z-4, which changes the routes for the X and Z receiver only. However, going into winter season, I will be adding more plays to their wristbands that will still have a numeric name, but instead of a diagram, it will just look like this: #31 – Trips Left – 841. Since they have been using the passing tree throughout this season, the need of diagramming the play will decrease. It may take some time before your team has the passing tree fully integrated into their thinking so that it becomes second nature and they don’t have to think about it too long. I started with just running 1s and 2s during practice. In our warm up passing drills, I had the receivers line up close to the center. I told them to run a short out and this route is called a 1. Then as we ran the warm up, every time prior to the snap I would call out 1 to start instilling the route name with the action. One tip when starting out is make sure you run the receiver line on both side of the field. My first practice, we ran our warm up with the receivers always left of the quarterback. 1s were out toward the left away from the QB. 2s were in to the right towards the QB. My team started to associate 1 as left and 2 as right. The next practice when we did the same drill from the right side, about half my kids were running the route incorrectly. This was quickly corrected, but just a heads up. Each practice I would add 2-3 routes so after a couple weeks, the kids have had practice with all of them. Don’t be surprised how quickly they learn the 8 and 9 routes. Every kid wants to run post or go deep. The final key to having your team ready for game day is to have a set method for the calling plays. I call the receiver routes from left to right. Since we’re playing 5 on 5, we have a QB, center, and three others. If I call Trips Right – 157, my team knows that receiver furthest to the left is running the 1 route. The middle receiver is the 5 and the far right receiver is the 7. For the center, I just tell the specific route, such as Short Out Left. With the center, you have to specify the direction since they are in the middle of the field. Since a 3 is a deep out, this could be to either side of the field since both directions are toward the sideline.